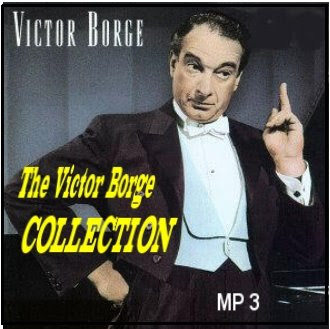 Victor Borge was born in Copenhagen, Denmark January 3, 1909, the son of Bernhard and Frederikke Rosenbaum. He was named Børge Rosenbaum, and his musical talent was no surprise as his father was a musician in the Royal Danish Chapel. He was educated at the Royal Danish Academy of Music by Olivo Krause, and later by Victor Schiøler, Frederic Lamond and Egon Petri. He had his piano debut in 1926 at "Odd Fellow Palæet" in Copenhagen and was recognized as a very talented musician. During the 1930's he became one of Denmark's most popular artists. He started his career as a classical pianist, but his talent for making the audience laugh was soon obvious, and he started developing his unique blend of humor and music. He had his revue debut in 1933 and his film debut in 1937. In 1940 he was forced to leave Denmark, and he traveled from Petsano to New York. Although he didn't speak English he soon managed to "translate" his humor, and he performed for the first time in Bing Crosby's radio show in 1941. In 1942 he was pronounced "the best new radio performer of the year" by the American press, and his radio and TV shows became extremely popular. He became an American citizen in 1948, and had his own show, "Comedy in Music", at The Golden Theatre, New York 1953-56. He had performed as soloist and conductor with leading orchestras from 1956, and has performed as Opera Conductor, e.g. Magic Flute, Cleveland Orchestra, 1979 and The Royal Danish Theatre, 1992. He established several trusts, and he received numerous honorable awards and honors. He was the patron of The Danish Royal Academy of Music Children’s Choir. With Robert Sherman he was the author of My Favorite Intermissions (1971) and My Favorite Comedies in Music (1981). Victor Borge died at home in his sleep, December 23rd, 2000.